After water remediation and a bit of demolition, our crew set out the proper equipment and bid adieu for the evening. We will return in the morning to monitor the site and gather new readings. 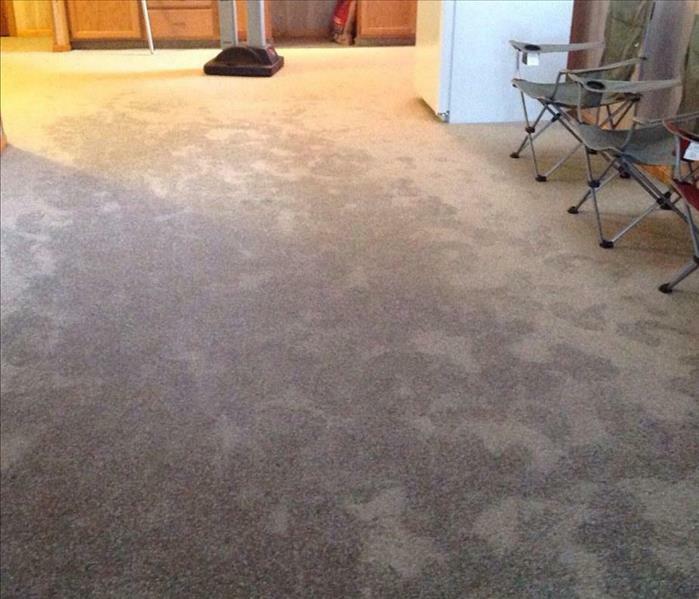 When carpeting is affected by water it becomes very heavy, even after extracting the majority of the water. Here Mari and Raul join forces to remove the affected carpet and padding. Working together in this type of situation is important for the safety of our crew members as well as keeping the remediation running smoothly and on time. When asked to clean the concrete floor of this machine shop, we jumped on the opportunity. We first pretreated the floor by applying our SERVPRO degreaser. Shown next is Raul, using an industrial steam pressure washer to remove over 50 years of grease and grime packed onto the concrete floor. The visible before and after is just incredible! Here our Crew Chief is gathering and explaining what products will be needed to clean an area rug that has been in a high traffic area. 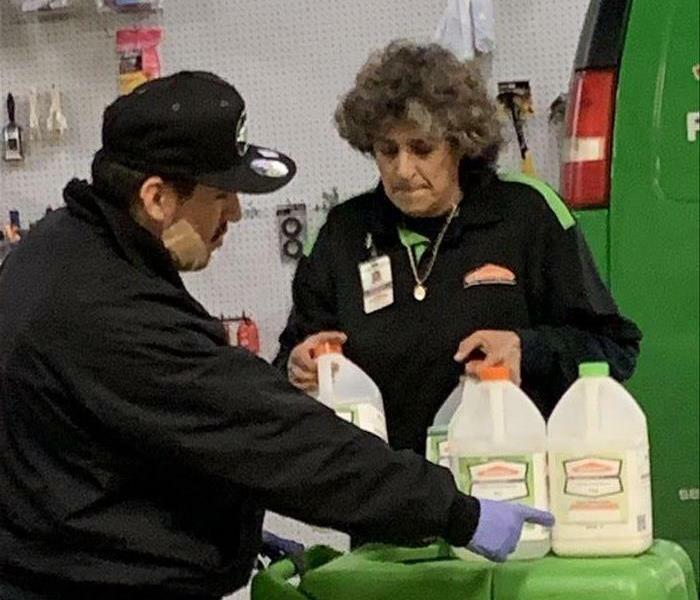 Mari is assisting and taking notes, learning the ideal SERVPRO way! Kids, pets and rainy days bring in dirt, mud and dirty water. 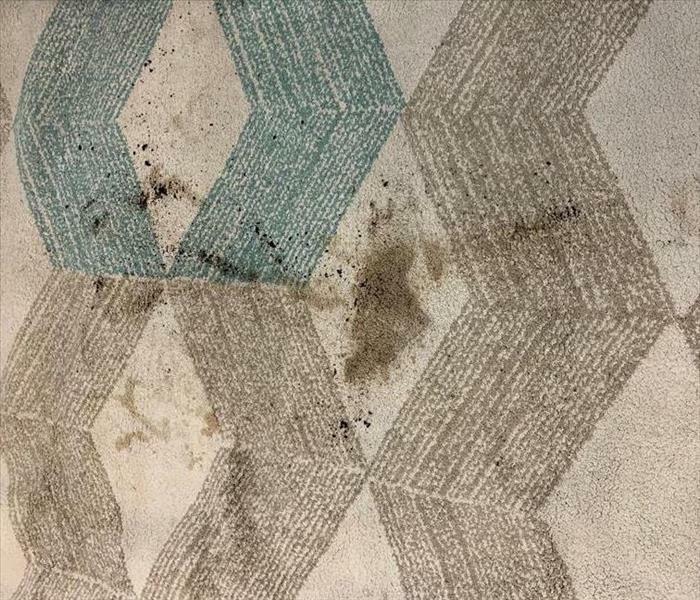 This area rug was cleaned and looked like new in just an hour with the help of SERVPRO! Mario is ready to tackle graffiti! 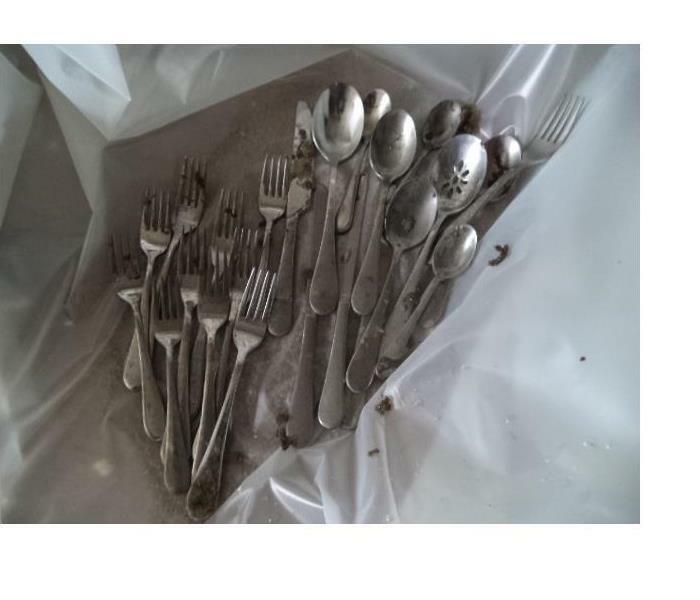 These silverware utensils were affected by a fire and were damaged from the soot. Once we cleaned the house of the soot we were able to clean the items as well and the customer was left happy "Like it never even happened." 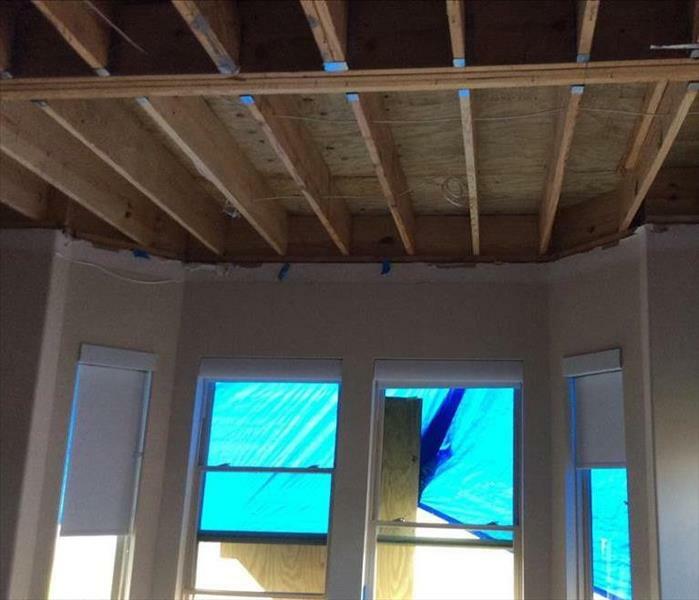 This room had been under construction and became saturated from a recent storm. To prevent any mold growth, we both brought in drying equipment to dry the environment and covered the affected area with an anti mold growth to further ensure the safety of the area. 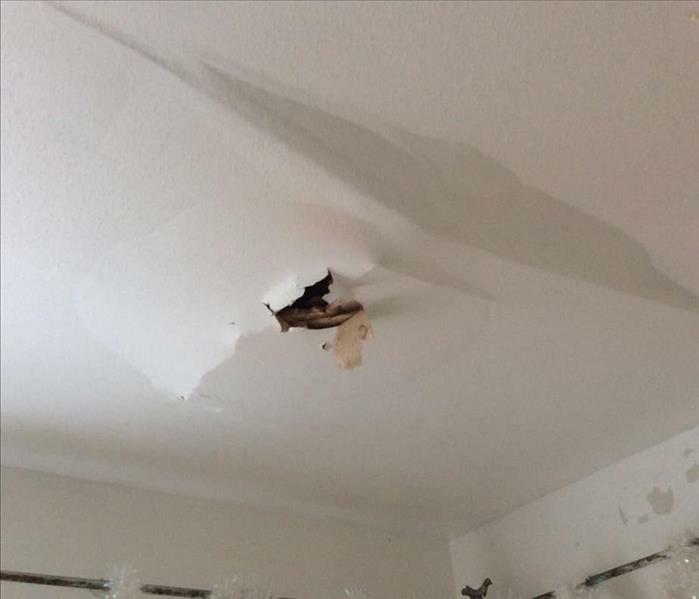 This home was affected by a water leak that spread over the ceiling as seen in the picture. And as you can see in the picture, if left unchecked for forty eight this leak can turn into a nasty mold problem. 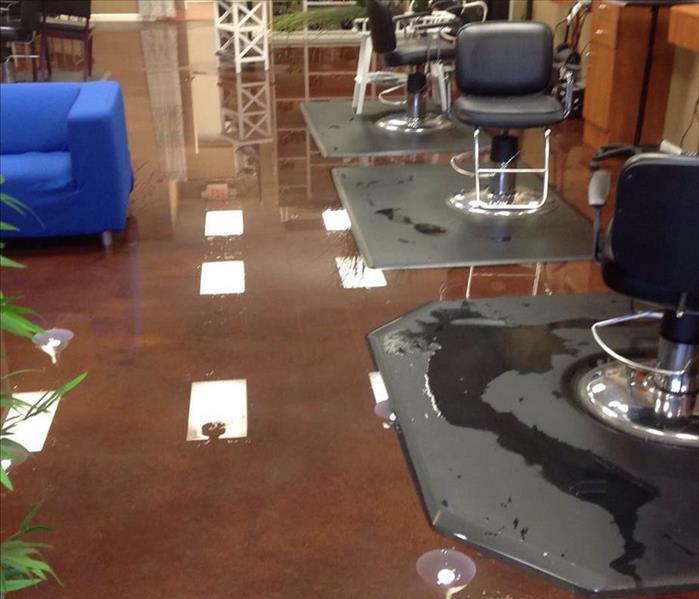 When water travels under wood flooring, usually this is the out-come. When water gets under wood flooring it causes the floor to rise. Call SERVPRO of Bear Creek to make it "Like it never even happened." As seen in the picture, the area affected has sustained a heavy amount of sewage backup. Once we arrived on site we cleaned and sanitized all areas. Mess cleaned - Return to a healthy and sanitary state. Thank you SERVPRO! 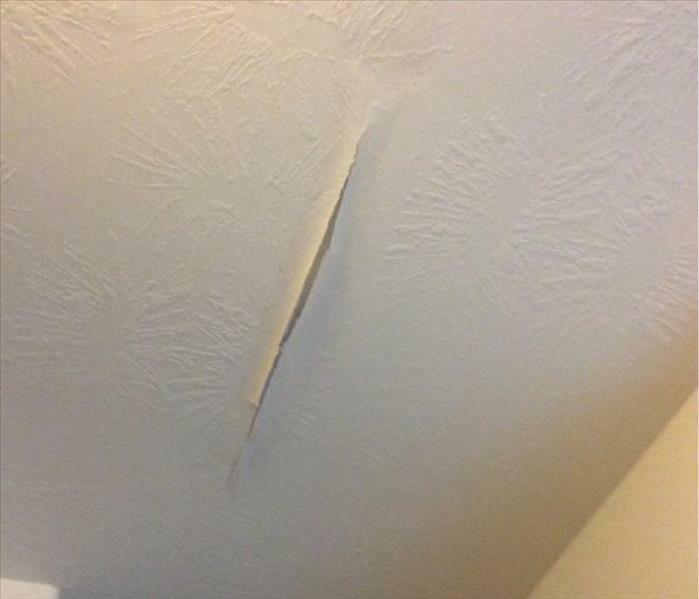 This ceiling had been damaged by heavy rain and eventually led to it collapsing in on itself. We were on the site within hours and were able to completely dry the area and restore it to a rebuilding state. 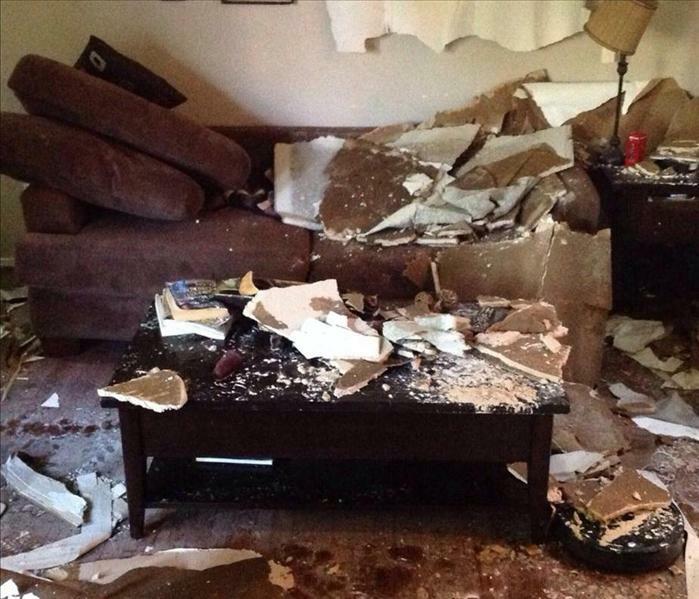 This home was the result of a natural disaster that carried into the inside of a home. 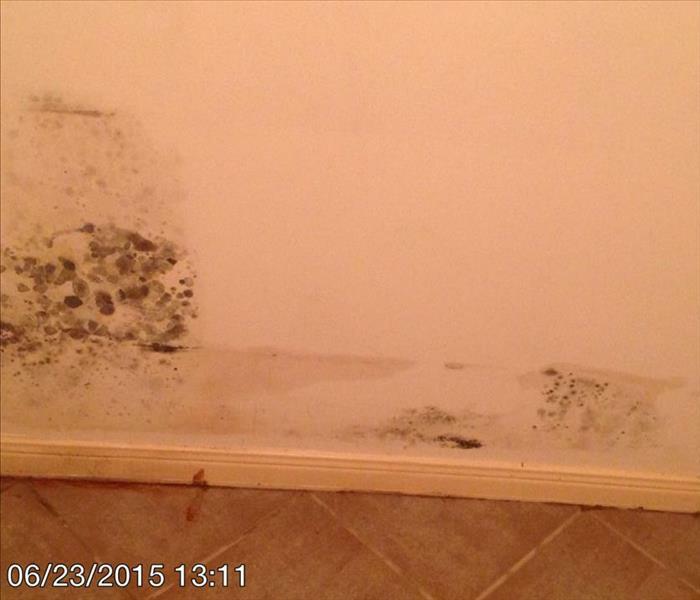 The owners called SERVPRO of Bear Creek and we were able to remediate the damage. 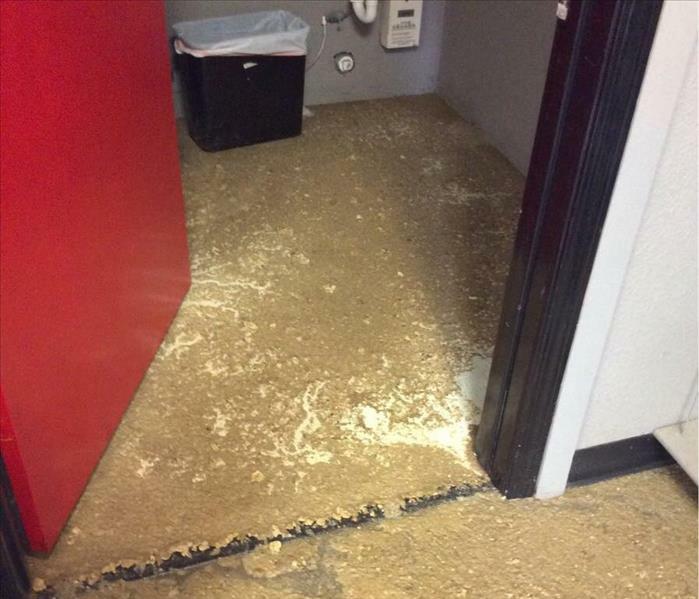 The picture shown in here was a result from a backup in the sewage line that caused the entire space to be covered in sewage that left an pungent odor through the building. We arrived on site and were able to clean the entire building to make it "like it never even happened". This was an aftermath of a home in the Houston area that was affected by an extreme fire. As you can see from the picture, most of the area is covered in charred burn marks or soot made from the fire. We arrived at the house and within a small few days, we were able to remove the damaged items and clean the house to a restorable condition "Like it never even happened". As a homeowner, the safety of your home is extremely important. The saying appearances can be deceiving stands true here. This small water line was enough to cause an entire house to have standing water as well as damage the wood flooring it was on and the drywall it touched. But with our SERVPRO equipment and expertise we can clean it up "Like it never even happened". 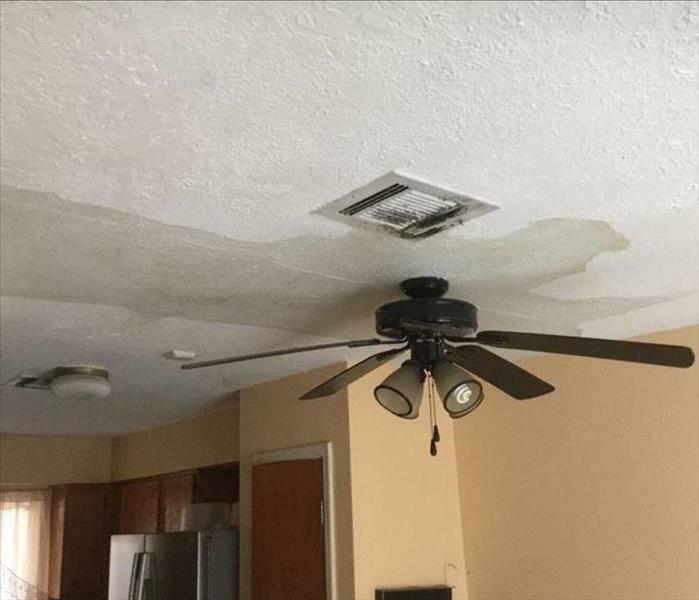 This home in the Houston area was affected by an unknown water leak from behind the refrigerator. Not only was the wall behind the refrigerator affected but the room behind the wall as well. As you can see from the picture, the entirety of the drywall is covered in mold. What we did was isolate the mold so it could not spread and grow anywhere else in the house. Next we removed any drywall that had mold or mildew on it and disposed of it properly. And once we had finished all of those steps we coated the affected area with an anti microbial to prevent any future growth and upon finishing the homeowner was elated of our work. 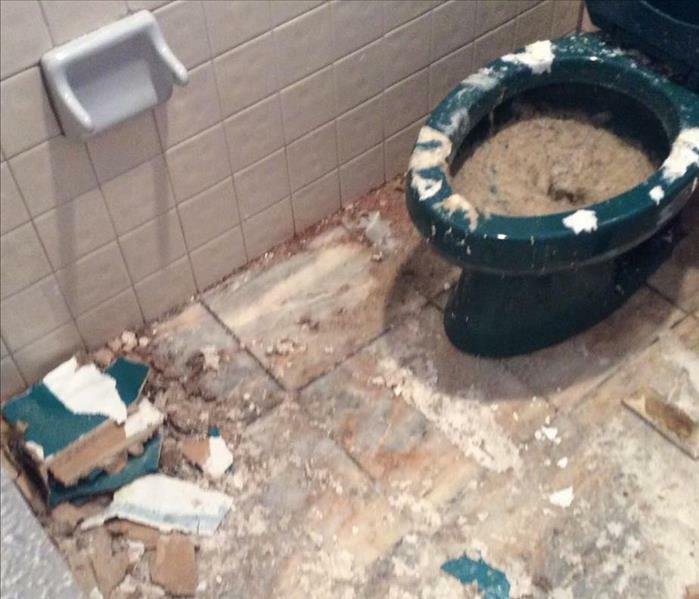 This house was affected by a broken supply line from a toilet that had ran for a number of hours. 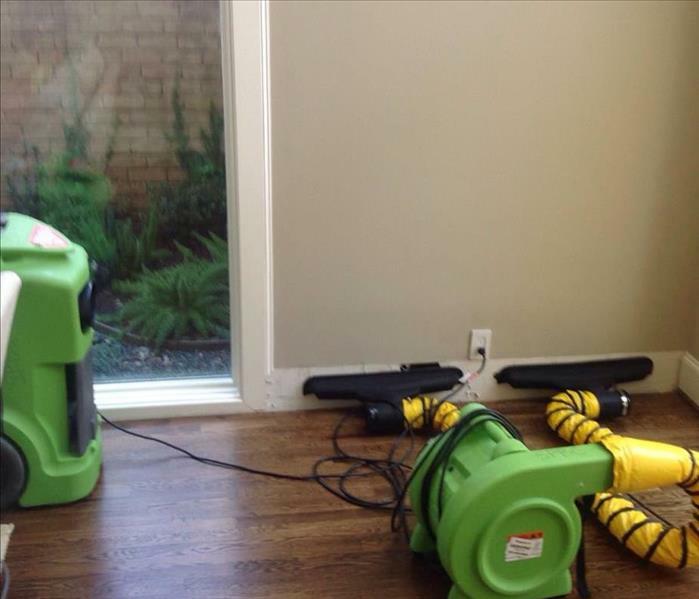 We removed the damaged flooring and baseboards to prevent the growth of mold and placed the proper drying equipment for a quick and efficient drying process. Cleaning up flood damage? No problem for us! Unexpected water loss. Who do you call? 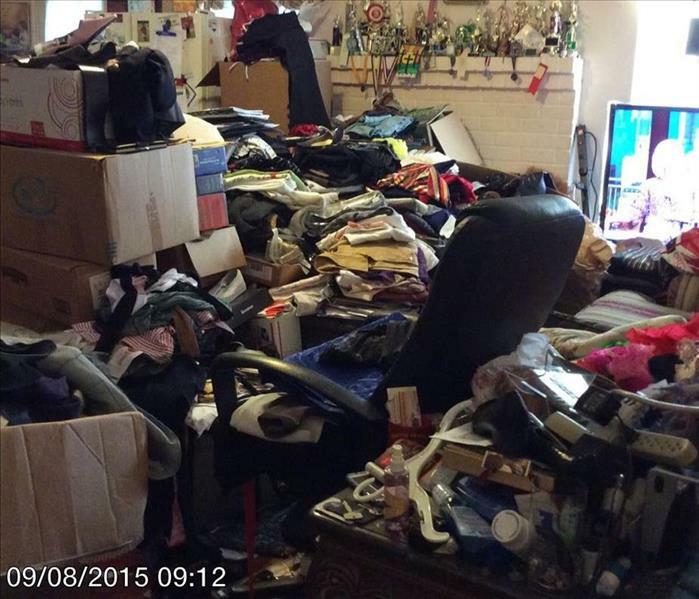 Not the kind of mess anyone wants to come home to. 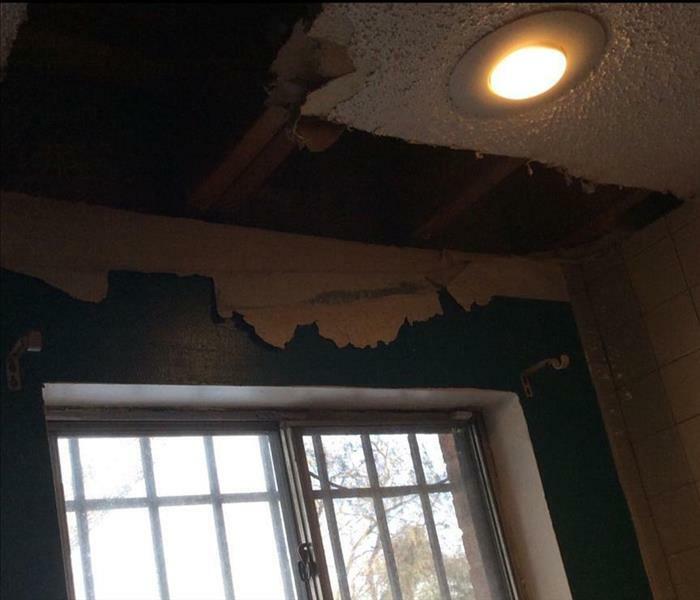 Thankfully, SERVPRO was here that evening stabilizing the moisture level and getting out the damaged materials. House was dry and ready for rebuild in 4 days. Damaged floating wood flooring with vapor barrier underlay. 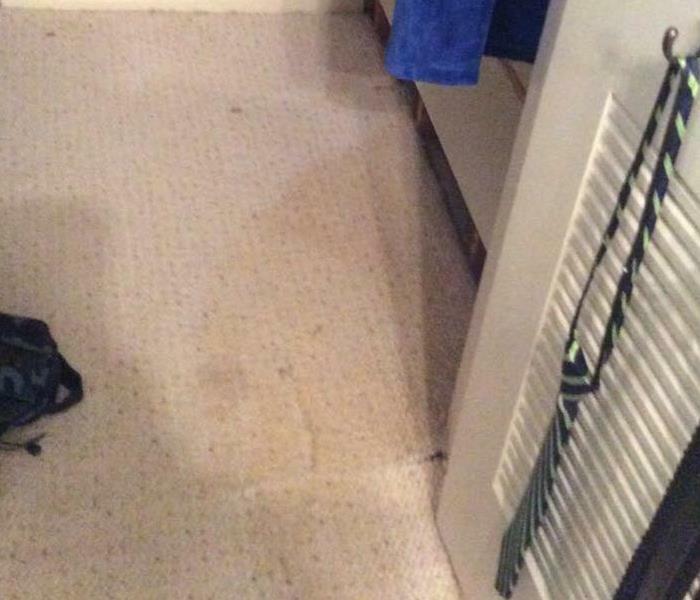 Water damage is fast and furious when these lines break. 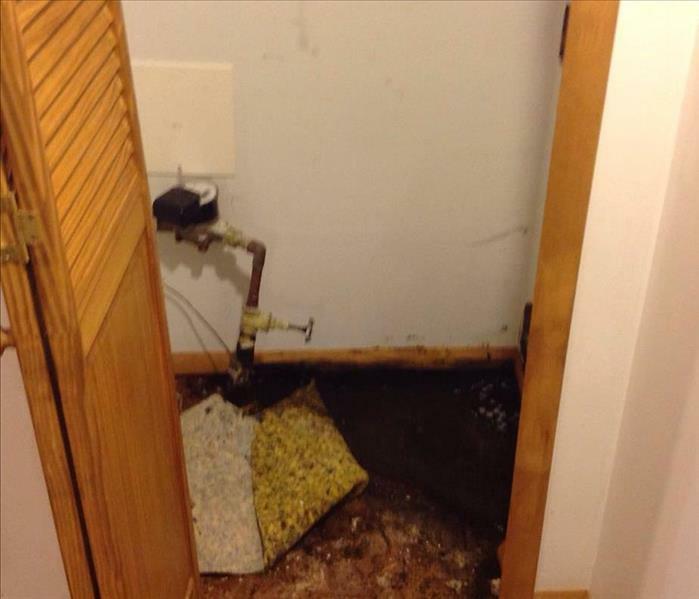 When a loss like this occurs, it is very important that you as a homeowner stays safe because losses such as these can be very dangerous to you if the mold and sewage is irritated. *See our blog on "24 Hour Mold restoration service" for more information on mold. 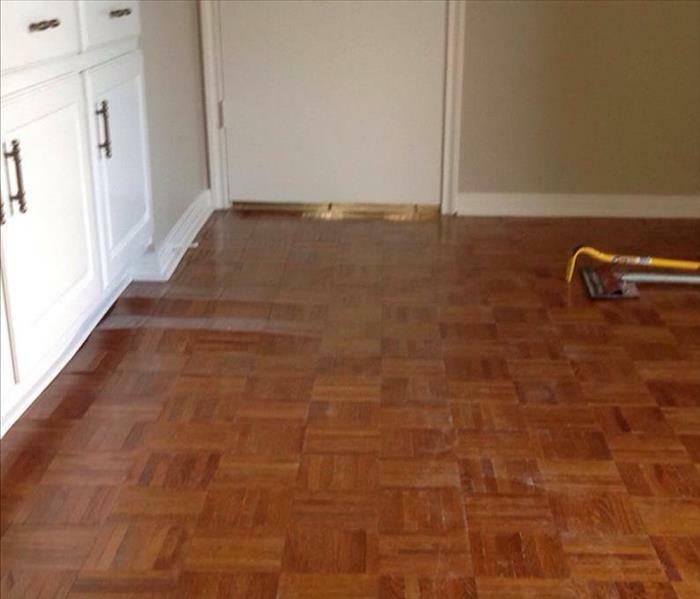 These beautiful hardwoods were saved due to SERVPRO fast action and right equipment. When the construction crews have left and you need the place REALLY cleaned and cleared of dust, call SERVPRO. Check out the Before/After page to see how this kitchen looked after we left. This graffiti on a warehouse door was located in the Houston area and was removed using SERVPRO's Graffiti Removal Product. Check out the "Before/After" section to see the results. "Like it never even happened". Throughout your ventilation systems, moisture and debris can build up causing mold and fungus to grow. 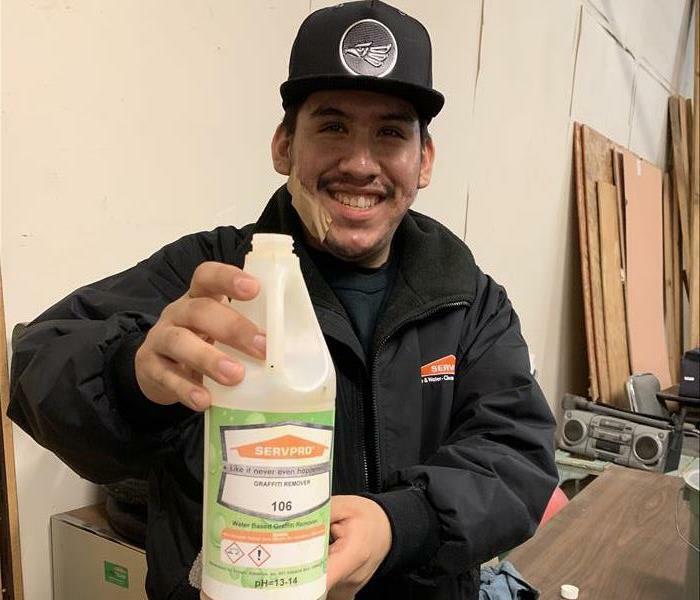 The experts at SERVPRO of Bear Creek have the know how and the equipment to both stop the growth of mold and prevent it from growing in the future. The right vehicle for the right job. Owners mingling with the crews! 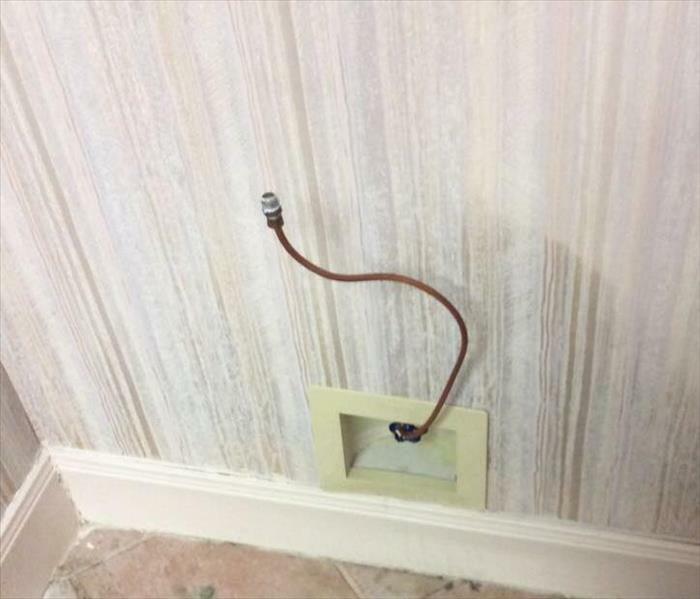 This was the source of a fire in high-rise condo in Houston that set off sprinkler systems and flooded four floors. 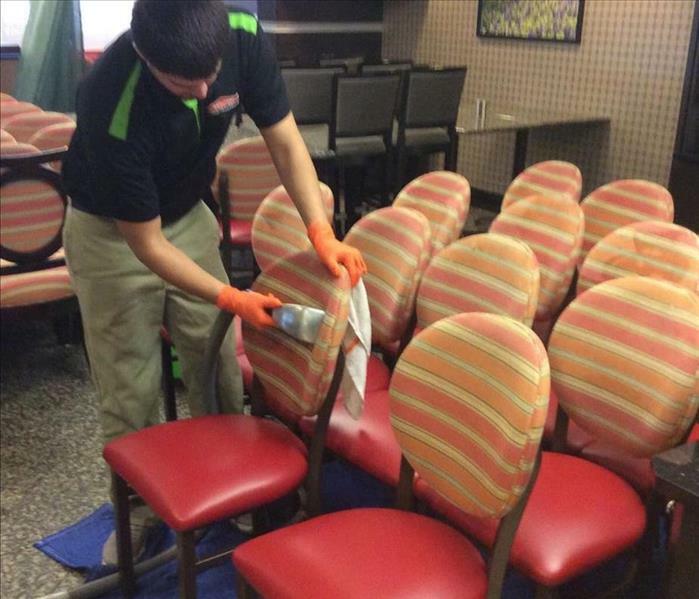 SERVPRO responded quickly, mitigated damages and halted any odors from creating. 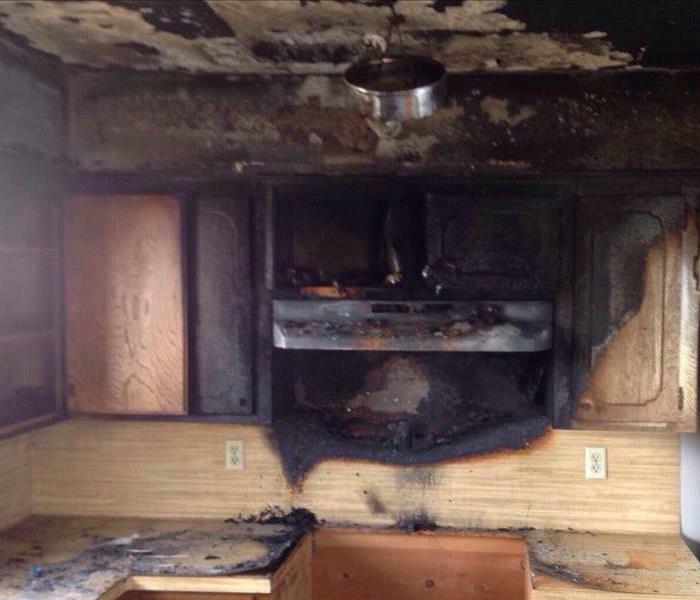 If you have fire damage in your home, the professionals at SERVPRO of Bear Creek have both the knowledge and the resources to help restore your home to a living condition. SERVPRO cleaning crews removing soot from smoke damaged home. Don't ignore this . . . Call SERVPRO! 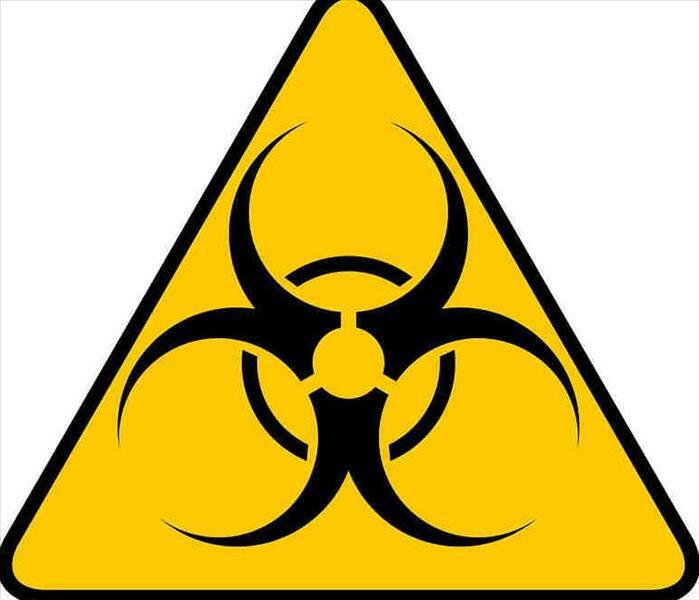 Having mold in your home is a dangerous entity. If not contained and stopped, can cause tremendous damage to your home. If you see this in your home, don't ignore it. Call SERVPRO! 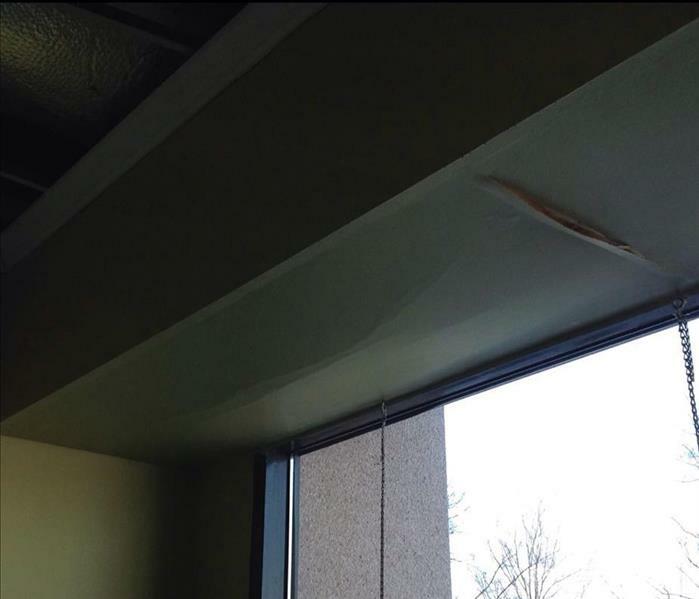 This water damage occurred from a storm that made the ceiling collapse from the amount of water that was in the dry-wall. SERVPRO of Bear Creek has technicians on hand twenty four seven ready to respond to any size disaster. 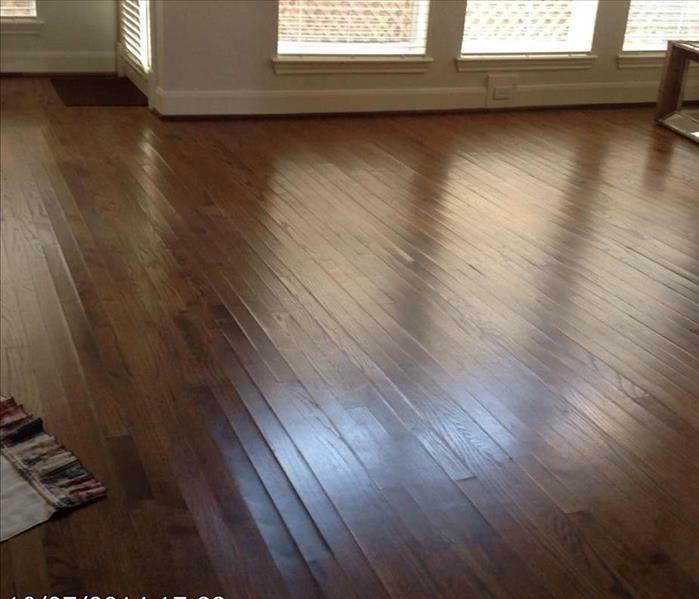 Wood floors almost always look amazing in your home, except when water enters and damages them. That is why here at SERVPRO of Bear Creek, we understand how important it is to have a fast response team out to save your wooden floors. Within forty eight hours of water damage the likely hood of mold growing increases exponentially. 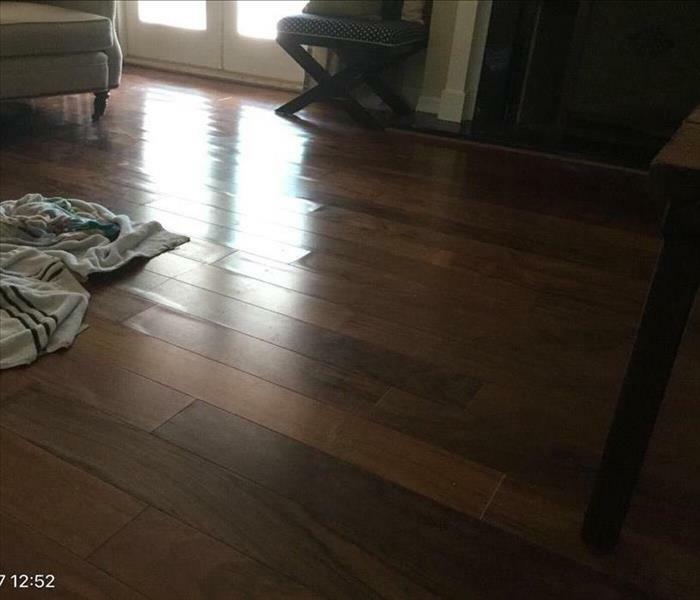 If your wooden floors have water damage, call SERVPRO of Bear Creek to have them removed and cleaned before any mold grows. This chair was part of a major fire in a home in the Houston area. After being deodorized, the chair was cleaned of any soot and damage that may have been on it. Commercial water loss at 6pm. SERVPRO onsite in 30 minutes. Customer resumed business next day. Can we make these look like new? Yes we can! Check out the before/after pictures to see how these turned out. 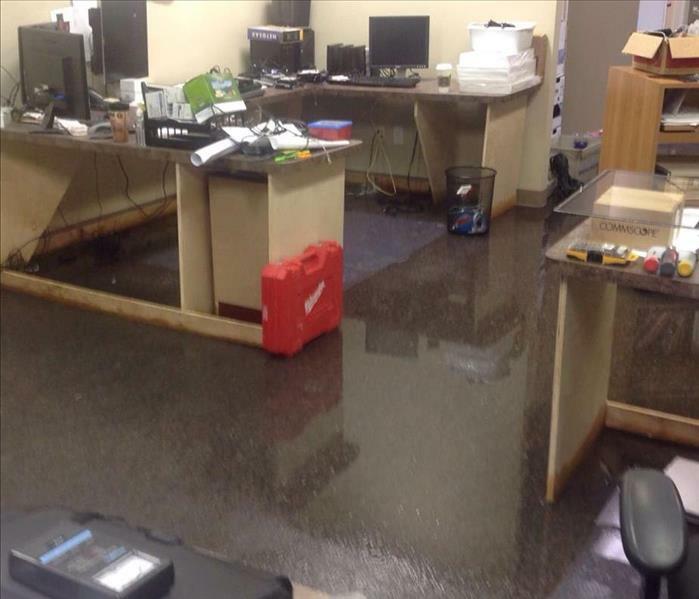 When water overflows a business, it is imperative to clean the disaster as quickly as possible to keep the business running. 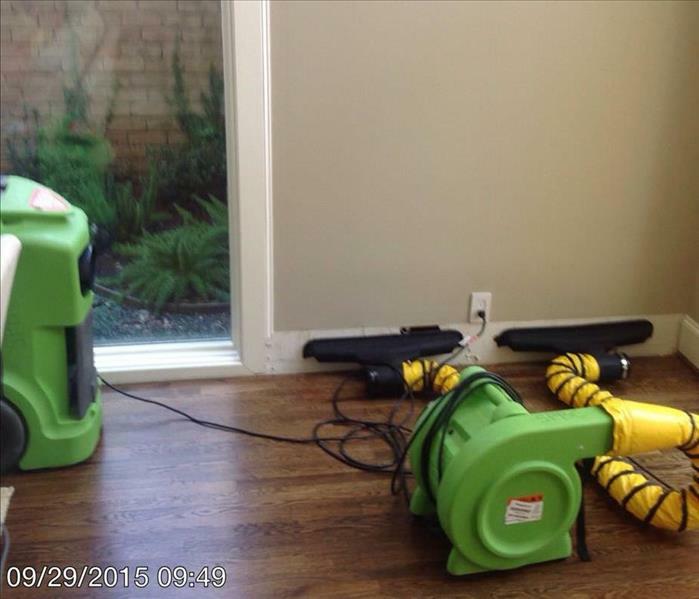 SERVPRO of Bear Creek was able to get the customer open for business the next day. Recent roof leak leave behind a wet wall? 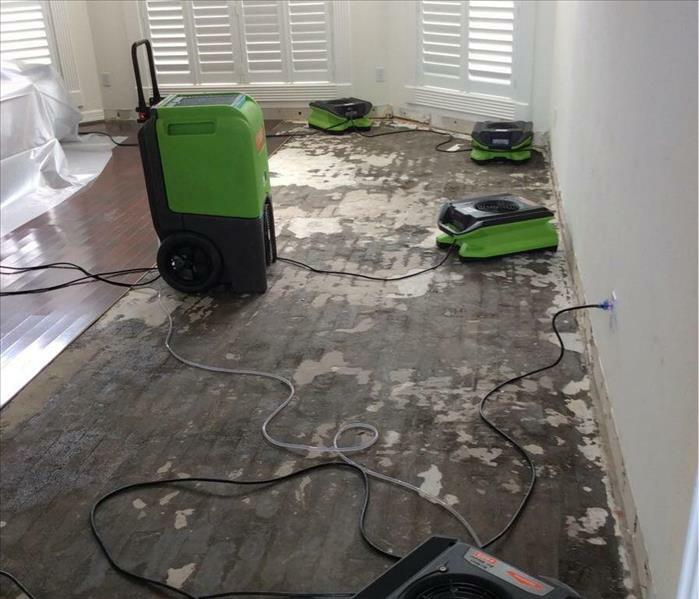 SERVPRO can check for moisture and dry it out at a fraction of the cost to tear out & rebuild. Call us for more information at 281-463-9800. Effective mitigation is much less expensive than restoration. That is why the professionals at SERVPRO of Bear Creek are always on call twenty four seven to respond to any emergency. 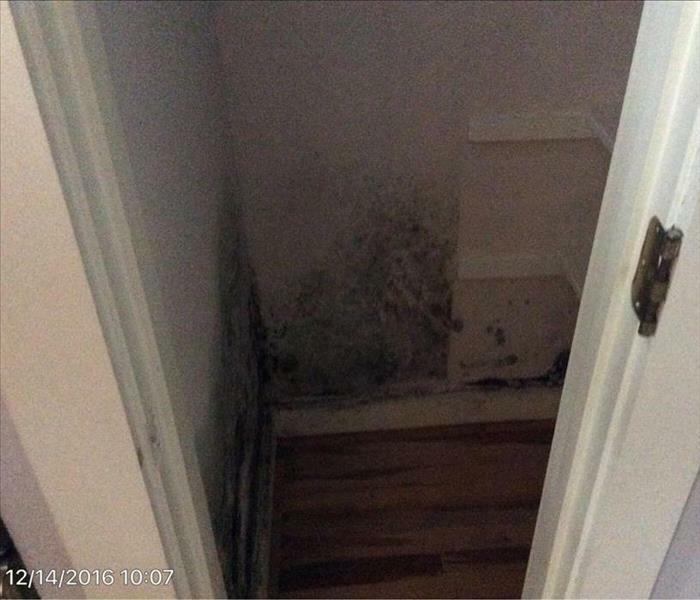 This was the aftermath of a water loss in a home and the contents were not completely and correctly dried, there-fore a result of mold growth. Got mold growth on your vintage records? Call SERVPRO! 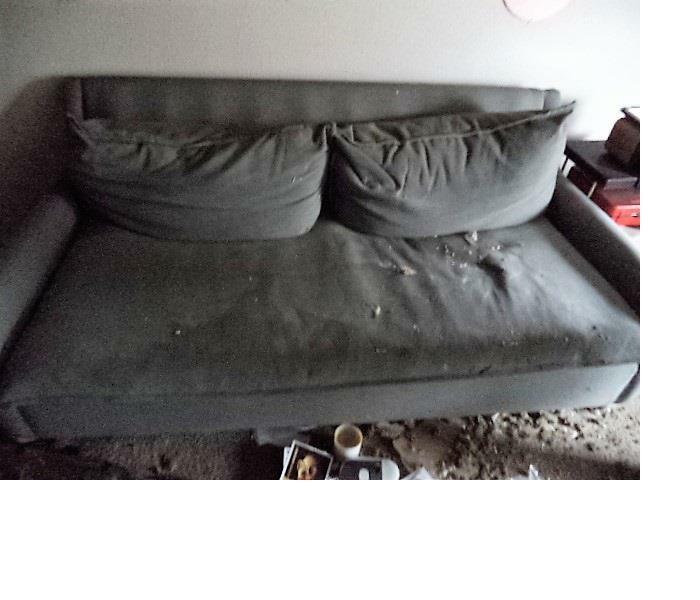 Need some upholstery cleaning done? SERVPRO makes it "Like it never even happened." Commercial mold protection applications. An excellent treatment to avoid mold problems in the future. 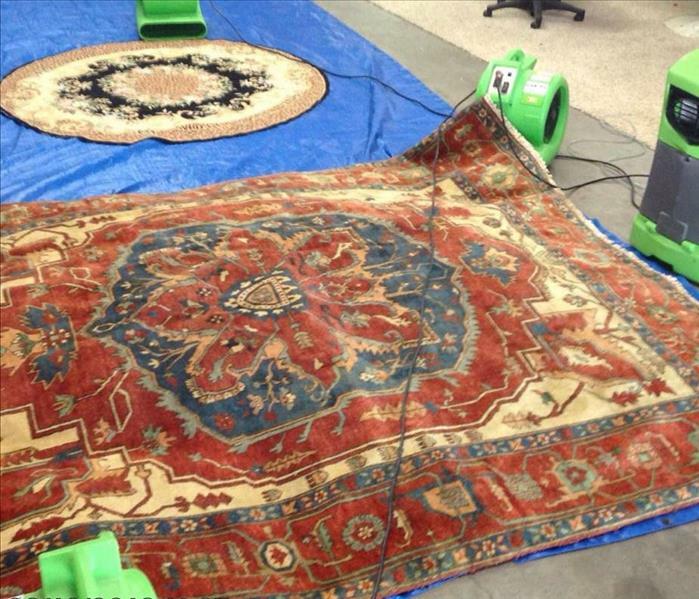 These rugs were taken back to the shop for a nice cleaning and deodorization. They were dried and ready for the customer the very next day "Like it never even happened."